Sahli Olives for sale. Buy online at Zingerman's Mail Order. Gourmet Gifts. Food Gifts. From Tunisia comes the underdog of the olive world. Sahli olives are fighting an uphill battle for recognition and a place in our pantries. For starters, next to no one in America has heard of them. They’re small in a world where the average American thinks bigger is better. They’re naturally cured, so they’re not inexpensive. And they come from Tunisia, a country many aren’t familiar with. But we Americans love underdog foods—especially ones that taste this good—so I think they have a chance. Small, sweet, purple-black Sahlis possess a flavor way larger than their small size might lead you to believe. 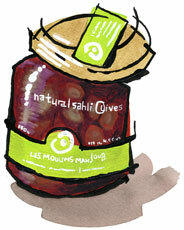 The maker, Majid, explains, “Sahli olives can be harvested between January and February, only by hand. It is the best way to harvest them but also very expensive. The key for hand harvesting is not to break the delicate fruit skin in any way.” The best of the Sahli harvest go into a natural salt brine. If they don't make the cut they become olive oil olives. They cure until the following December, and Majid says, with a mischievous tone, “They are ready to bottle when the olive’s flesh falls off the pit easily by one's tongue."